In the summers of 2017 and 2018, heat waves and drought conditions spawned hundreds of wildfires in the western U.S. And in November, two more devastating wildfires broke out in California, scorching thousands of acres of forest, destroying homes and even claiming lives. 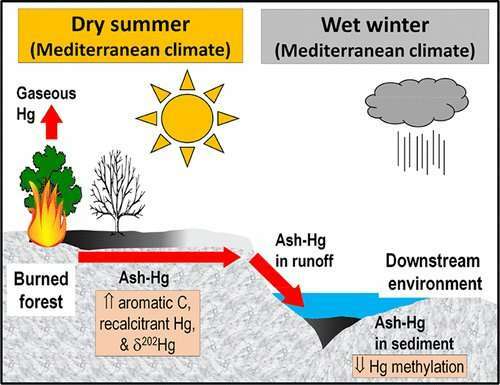 Now, researchers studying ash from recent California wildfires report in ACS' Environmental Science & Technology that burned material in forests might help sequester mercury that otherwise would be released into the environment. Then a pulse of flood-water mobilises this sediment, flushes the mercury into the ocean and starts it up the food-chain ? ?